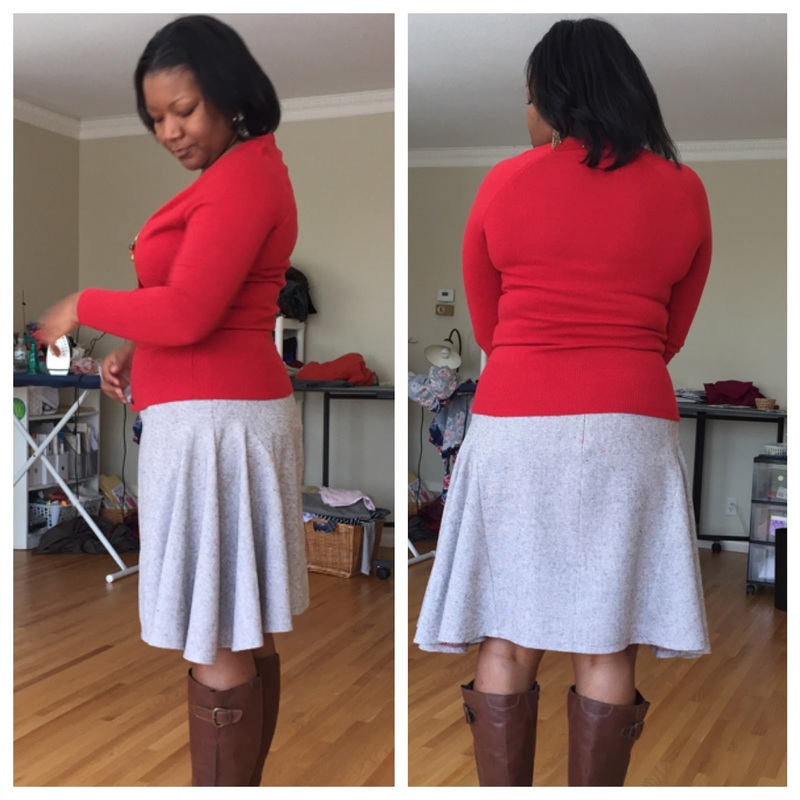 Recently, I've happily been able to reintroduce skirts into my wardrobe! I have really been looking for interesting skirt silhouettes and Vogue 8750 definitely fits the bill. I picked up this J. Crew tweed during a designer fabric sale. It's a 50/50 wool/poly blend with lovely little flecks of orange, brown and pink. It washed up well (the hand of the fabric softened just a bit) and takes a press nicely. I really enjoyed working with it and am so happy to have enough left for a jacket! I just loved those seam lines on the pattern and was happy to see that the shortest, fuller version only needed 1 5/8 yards of fabric. 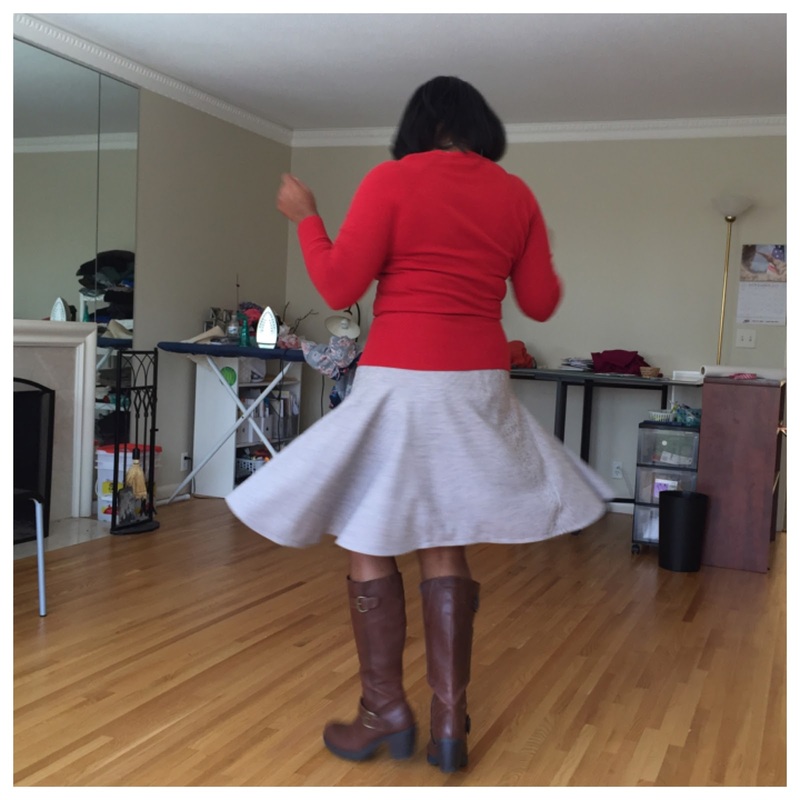 Typical for me with skirts, I cut a size 16 front and 18 back. There are lots of notches and other marks to help keep everything lined up. 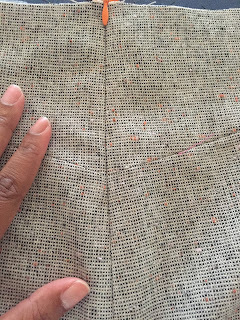 Because my fabric is highly textured, I used tailor tacks to keep track of all of the markings. 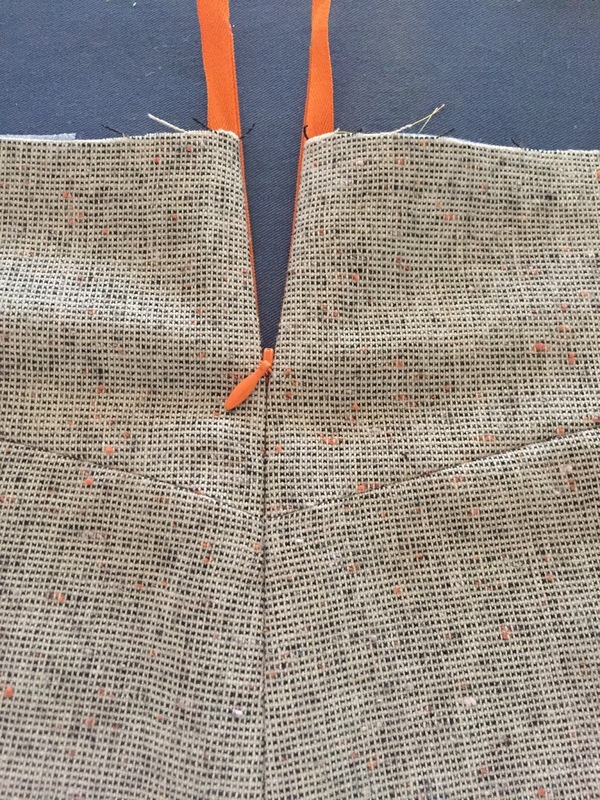 The pattern calls for grosgrain ribbon to finish the waist. 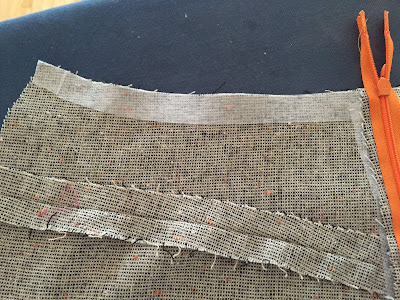 When this treatment is used, I like to use strips of interfacing at the waist rather than staystitching. 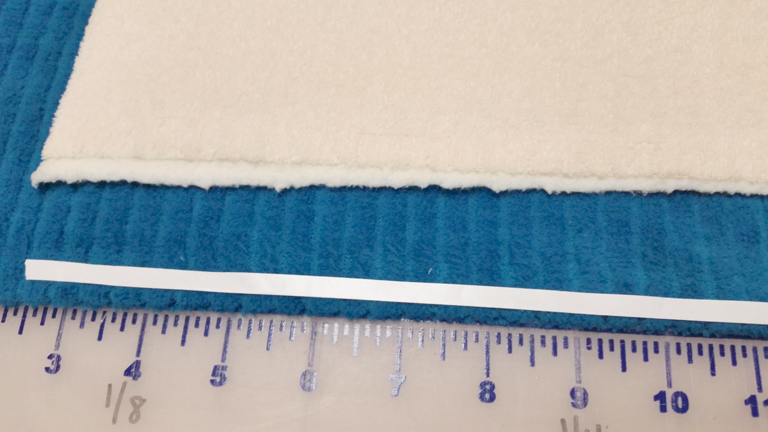 I also interfaced the zipper area with 1" strips to reduce buckling once the invisible zipper is in. At my daughter's insistence, I went with an orange zipper. 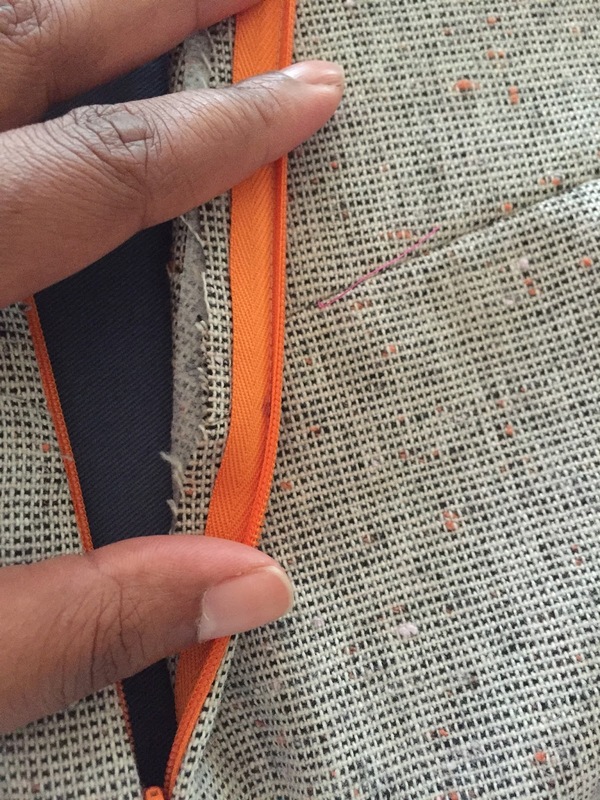 Here you can see where I marked the second side of the zipper to ensure I matched across the yoke seam. I decided that I wanted to line the skirt, but this decision was made after construction of the main skirt was almost complete. I knew I didn't want to line the flounces because I didn't want the skirt to get too heavy. 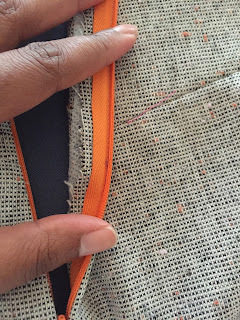 But I wasn't certain how to go about lining it without ripping out seams. I took to Instagram for advice and received two great suggestions: 1) Use an A-Line lining or 2) Underline it. But of course, there was a catch! 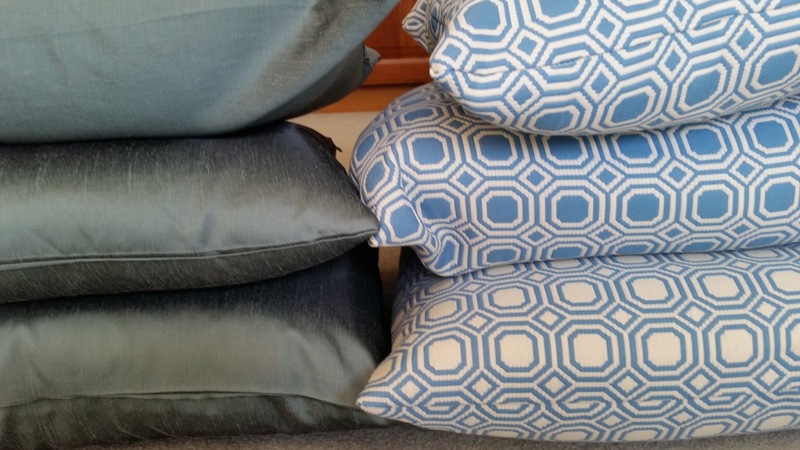 I had gone on the hunt for my lining fabric which I'd bought 8 yards of! Not finding it anywhere, I found this magenta polyester pongee (also from Fabric Mart) scrap that was large enough to cut the needed pattern pieces from. I had already cut everything out before posting on Instagram so 1) I did not have enough lining to recut and 2) I did not want to rip out seams to underline it. I decided to construct the lining pieces and finish the waist as usual. 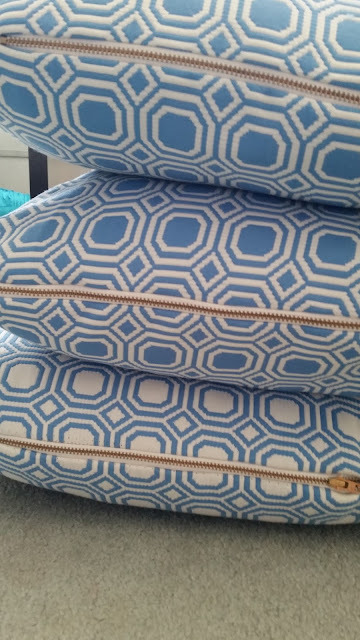 I always have an issue with the zipper tape at the corners. Will have to work on that! The lining is only attached at the waist and zipper, and then is allowed to hang free, with hand tacking at the hem. I ended up serging the raw ends since there would now be exposed seam allowances. This skirt was turning very colorful, very fast! But I like it! This photo shows how I ended up with a topstitched hem! 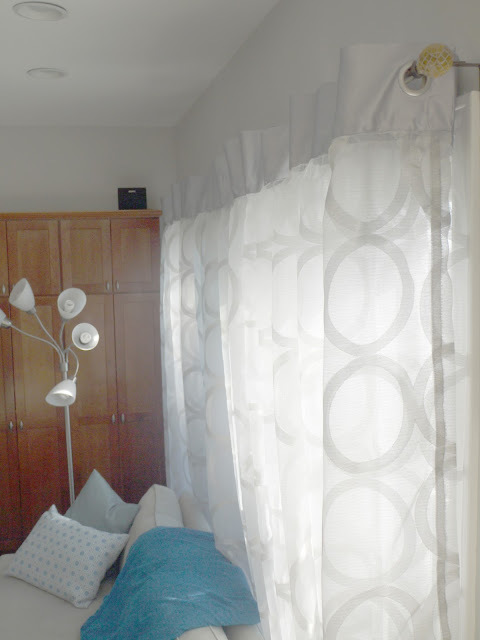 I was going to use hem tape as I really liked the length as-is when it was unhemmed. However, there is lots and lots of fabric at the hem and I ran out of hem tape. 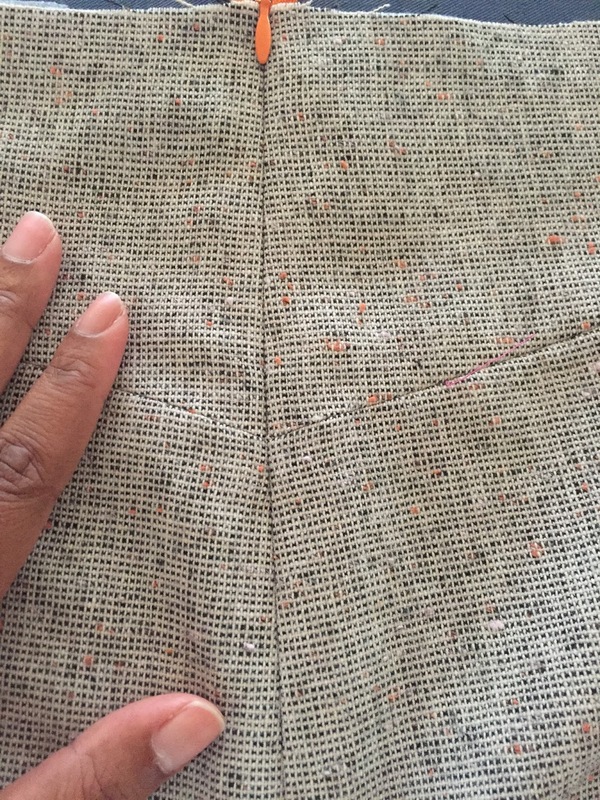 Deciding that the texture and color in the fabric could easily hide a topstitched hem; I went for it! I'm satisfied with the outcome. Initially, I wasn't in love with the side panels. Once it was finished, and made into an 'outfit', I nearly began to like it a whole lot more. In the back, you can see it rides up a bit. I'll make a note to add a wedge to the back. 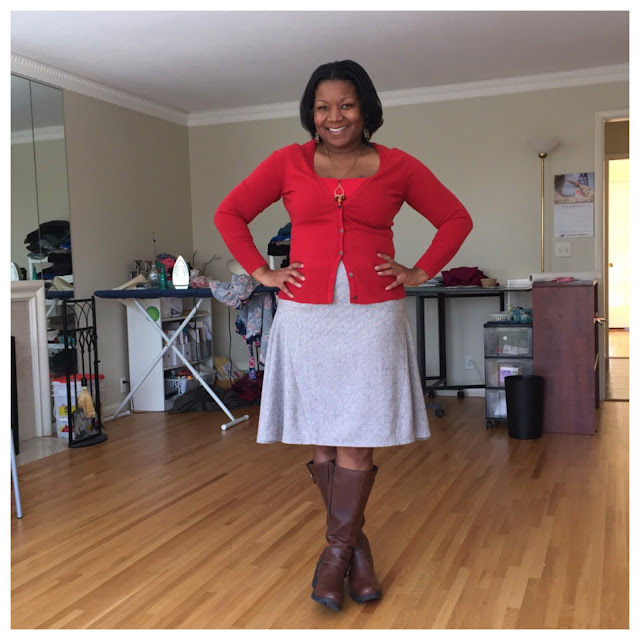 I made it a bit extra work for myself, but it was still a very satisfying project and I can't wait to sew my jacket with the tweed! Hurry, there are 23.5 yards left!! 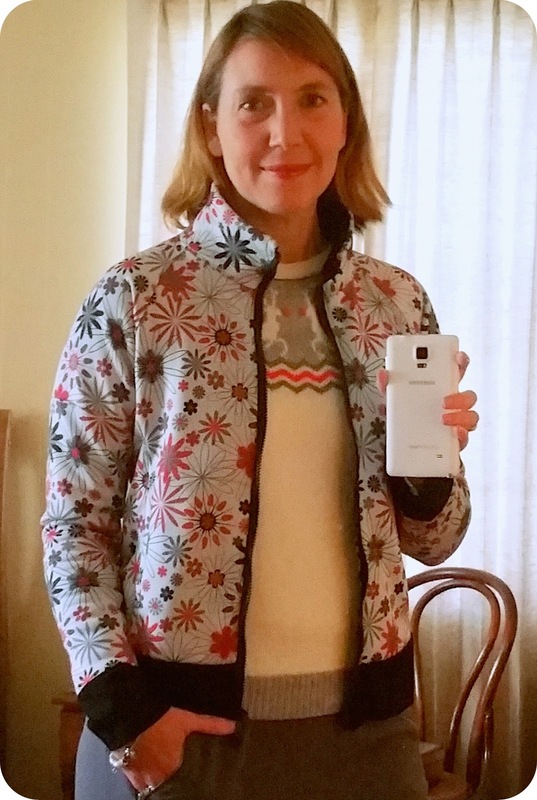 Made by a Fabricista: The Perfect Jacket. The Perfect Pants. 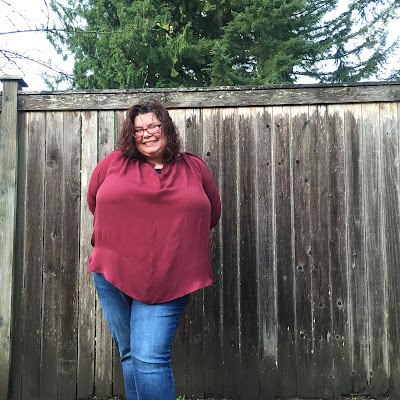 I feel like I spend so much time focused on creating clothing that is dressy and unique (like my last make for the Fabric Mart blog) that it was high time I go and make something that is more casual and more practical. 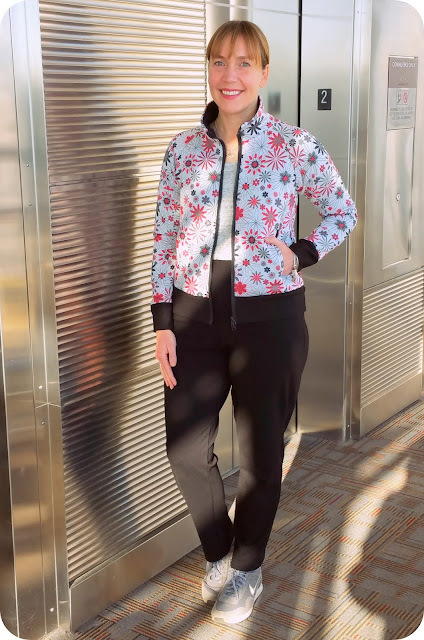 Enter my foray into the athleisure trend! 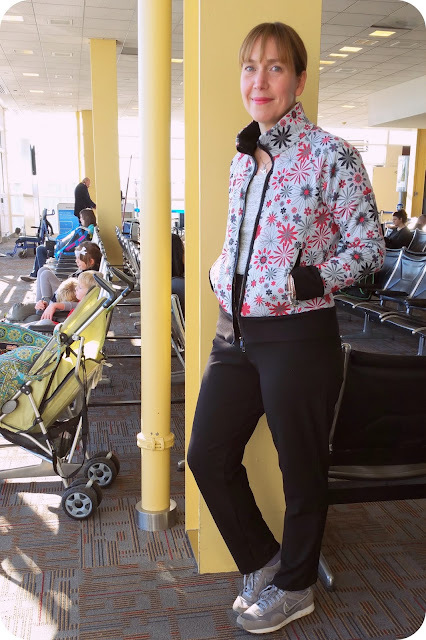 I decided on two patterns would be perfect for my kind of athletic wear, McCalls 6901 for the pants, and Jalie 2795 for the jacket. I don't run, I don't play team sports in a gym or a field, and I don't work up a sweat in a aerobics class. I do, however, swim and walk. A LOT. And anytime I walk or swim, I do things on either end of the walk or swim. In fact my long walks are usually so I can get exercise AND get someplace. So I decided I wanted these patterns because they don't just look like workout wear, they look like pieces you could wear outside of working out and no one would be wiser. There was also my personal need to stay warm and dry, especially on the days when I swim, since wintertime swimming is a bit of a crazy endeavor if you really think about it (though I do only swim in indoor pools in winter). :-) This was why I ended up choosing the fabric I did, I needed heavier wintertime knits that will keep me toasty and dry. A lot of swimmers own warmup gear, it keeps you from freezing before and after your swim. First let's discuss the jacket. 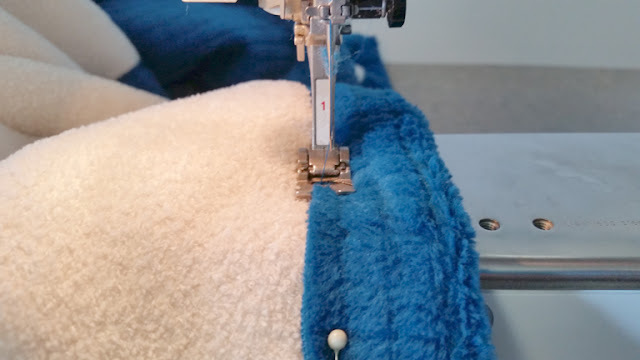 Turns out that I decided to make up the Jalie hoodie pattern (sans hoodie) when an actual sewalong was going on, lol. I didn't know about it and wasn't planning on being part of it, but by some randomness of the universe, there I was participating without knowing it! 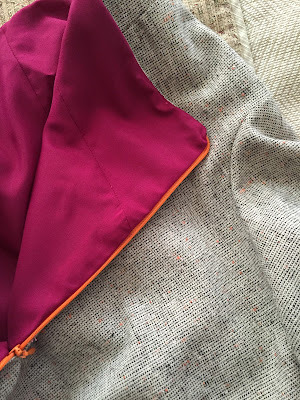 Julie, our gracious Fabric Mart blog moderator, also hosted a sewalong a couple of years ago, and between the two sewalongs, any questions I had about the construction of the jacket, I was more than "covered" with answers. 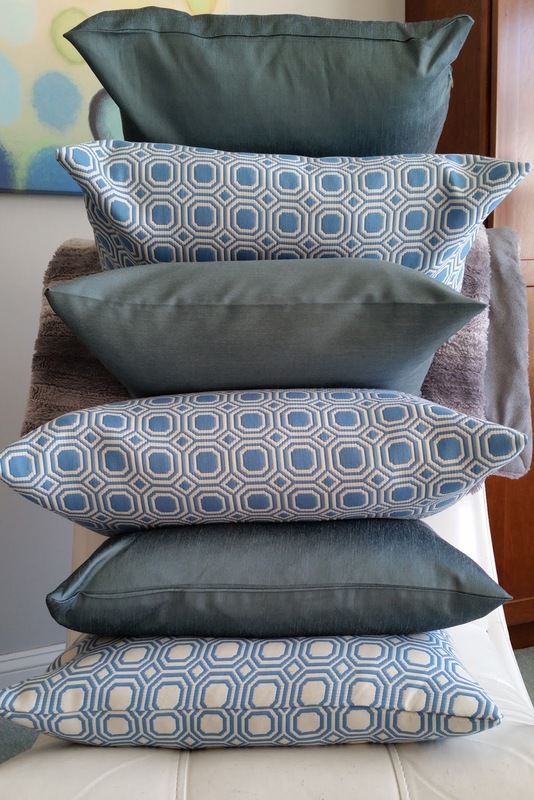 It was great and I wish all of my patterns I sew up would be part of sewalongs. 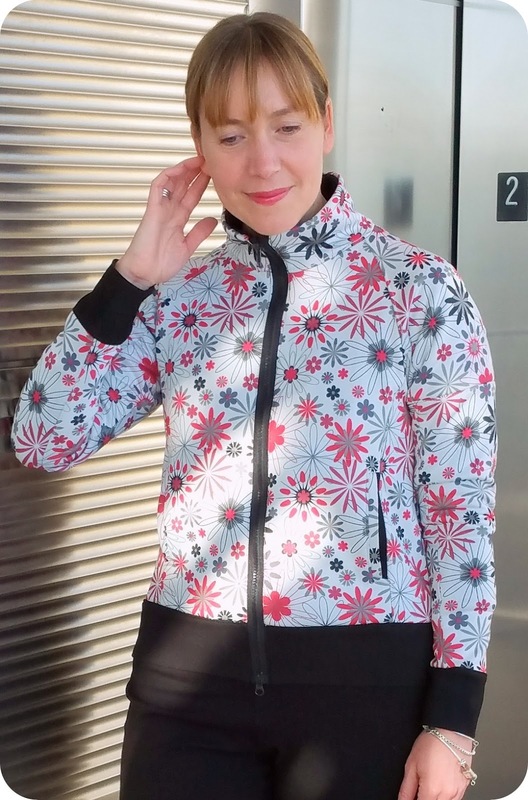 Another Fabricista, Sue, made a jacket from the other Jalie jacket pattern available at FM, too! Looks like I am in good company here! I was a little nervous that the jacket would be too small if I sized too accurately to my measurements, but almost all the reviews I read said that the pattern had exact amount of ease needed for the measurements stated on the envelope. So my bust of around 34" (fullest part) was fine in the size S (made for 34" busts) and my waist and hips were fine in the size U (made for a 39" hip). 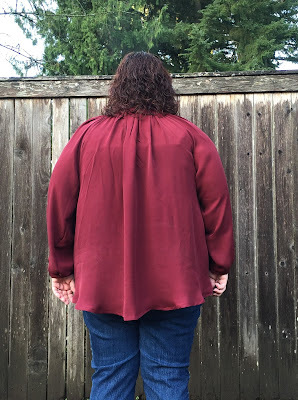 I didn't really grade, per se, from the S to the U, I just made all of the top half of the jacket in the size S (and the sleeves, too), and made all of the bottom parts of the pattern in the size U. My waist is actually closer to the S/T size, but it's a casual jacket, so I didn't really go seeking something with more waist definition. When the pieces would have a top/bottom portion, like the middle part of the front and back, I would just trace the S on the top part, and the U on the bottom bit. t was actually super easy, and I wish all patterns were that easy to adjust for my pear shape. The fabric I used was a fabulous fleece backed knit fabric. 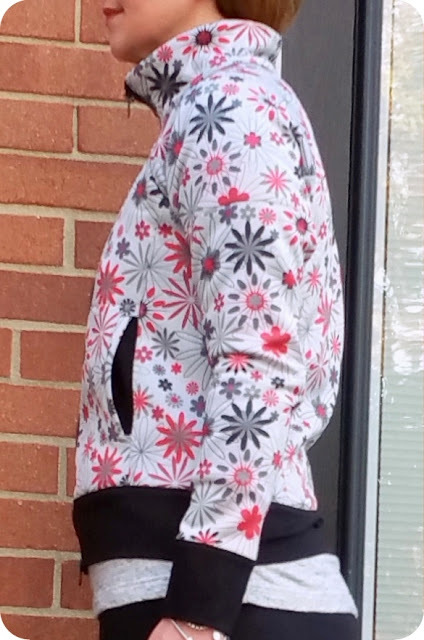 The outer portion has a lovely retro floral design in red/black/grey/silver and features a bit of a sheen for interest. 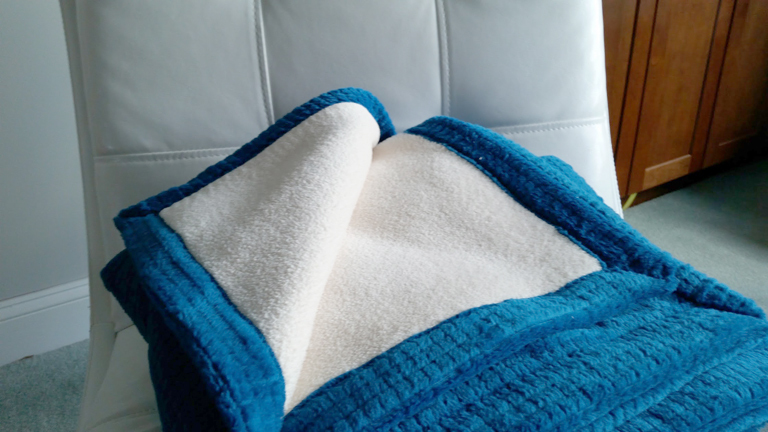 The fleece backing is very soft and pretty thin, so it doesn't add a ton of bulk, but adds a whole lot of warmth (cozy fleece lined pockets--yum!). It also meant that there was a bit of structure, so the cool stand-up collar actually stands up, even when the jacket is zipped open. They have no more of this amazing fabric on their site, sadly. Maybe more will come to them! We can hope! The biggest challenge with this pattern was the number of pieces! Woah! So many. I spent so much time cutting the pattern out. Sewing it up was fine, provided my serger was being cooperative (which it wasn't the whole time, sigh), but there are a lot of seams and topstitching. I feel like the great fit and very finished look comes from all those seams and topstitching, so it is worth the extra effort. The only thing I didn't dig was that the zipper has no facing and the hem band and sleeve bands are sewn into the jacket as a one piece instead of being sewn and then folded back so we could enclose the raw edges (like with binding a neckline). I may change up those on my next jacket I sew from this pattern. The hem and sleeve bands actually lead me to my next part of the post since they were made with the same fabric as the pants. (It made me feel like a proper RTW designer since a lot of RTW knit/athletic pieces are made from one fabric and then bound on the edges--neckline, hem, sleeves--with a contrast knit fabric, like a rib knit, or in this case a ponte knit.) I also made sure to use a dual separating zipper. I love it when jackets and coats have the two zip ends, so I wanted to make sure my homemade version had the same cool feature. So the pants! I have a pair of black pants I bought years ago from JCP (back when it was J.C. Penney!) that are knit, very comfortable, very dressy casual, and most importantly fit me like a freaking glove, including my weirdly shaped hip/crotch area. As boring as it is, making these black knit pants was a personal fit challenge, and I couldn't wait to spend (way too many) hours working on it so I could get a second pair of black pants that I can wear to death. But this time, I could add pockets, and demystify WHY these danged pants are my absolute favorites. I read that Julie would be doing a fit-a-long with Melissa Watson (daughter of Pati Palmer), and it dawned on me that I could use a Palmer-Pletsch pattern I already owned to create a muslin from so I could craft my own perfectly fitting knit pants. 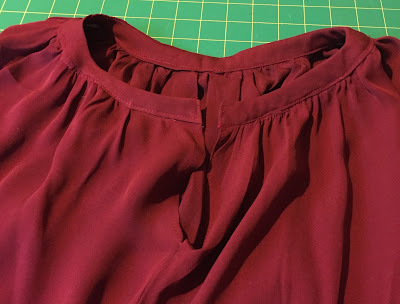 Well, McCalls 6901 helped me accomplish all of that but as it turned out, I crafted a perfect muslin for wovens, but I had to make quite a bit of change in the muslin for my knit pants (mainly in the upper hip area). 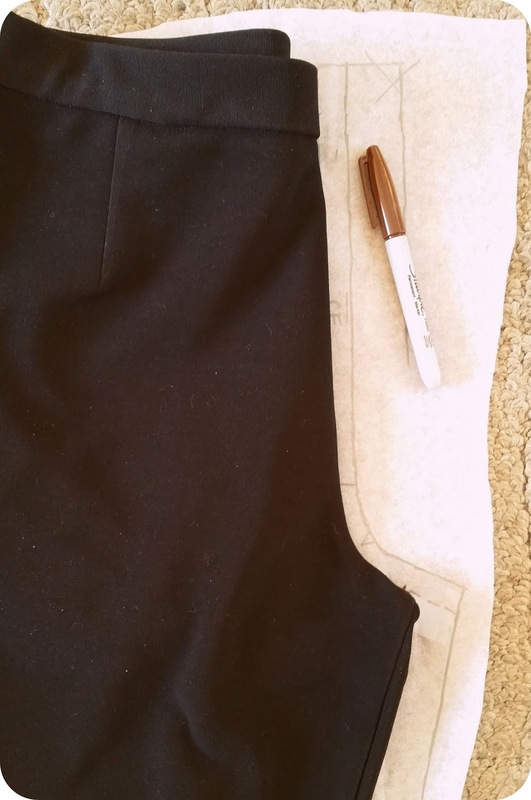 Initially I decided to lay my perfect pants on top of the crotch curve of my traced pattern (I know we can tissue fit, but I felt like this pattern paper was more durable for that particular need) and saw it was a very close match, which gave me a lot of hope for the pattern and my particular issues. I was very happy, in the end, with how the pattern worked for my frame, and my initial excitement turned out to be well-founded. 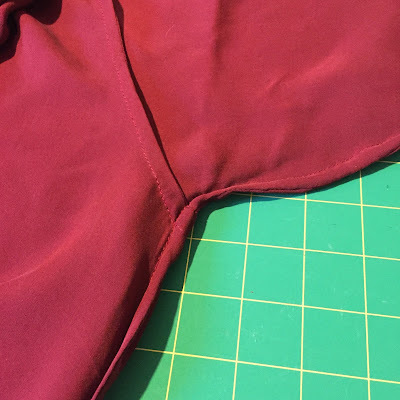 I found that I did need to let out the seams to almost nothing, though, right around the upper thigh area, and I had to deepen the crotch a bit since it was pretty tight there. 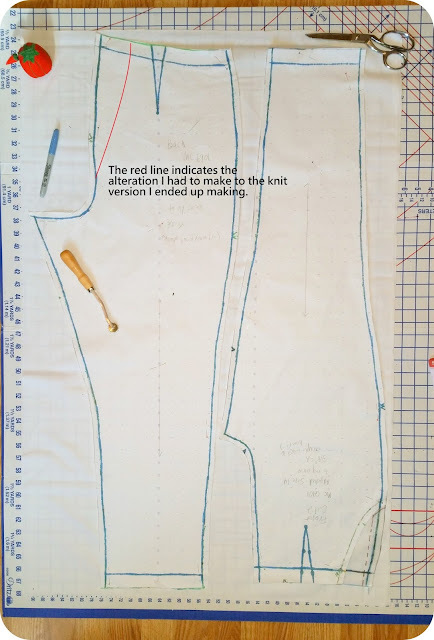 I ended up not having to lengthen the back length of the pattern, but I will say that I expected to...I have a really long crotch length in back. I did need to reduce the front length a touch, though, since the crotch of my pattern fitting had the droppy frown lines that usually indicate too much length. Well it was settled, I had a great woven pants pattern to use for the future. I decided if it worked for wovens, it would definitely work for knits, even though I realized I would probably have to take it in somewhere after sewing it up (I was right). 1. I don't need a zip. The ponte I used was super stretchy in both the cross grain and with the selvedge, so it was very unnecessary. 3. I didn't want to have legs that were too slim. I liked the idea of pants that were knit, so comfy, yes, but when legs get too slim on knit pants, they definitely start to look like pants that can only be worn to the gym. The pants are made from a black rayon/nylon/lycra blend from Italy. I immediately knew how special this fabric was after receiving it. It is super soft, a nice thickness, and especially stretchy. The fabric washed and dried beautifully, with absolutely no pilling. 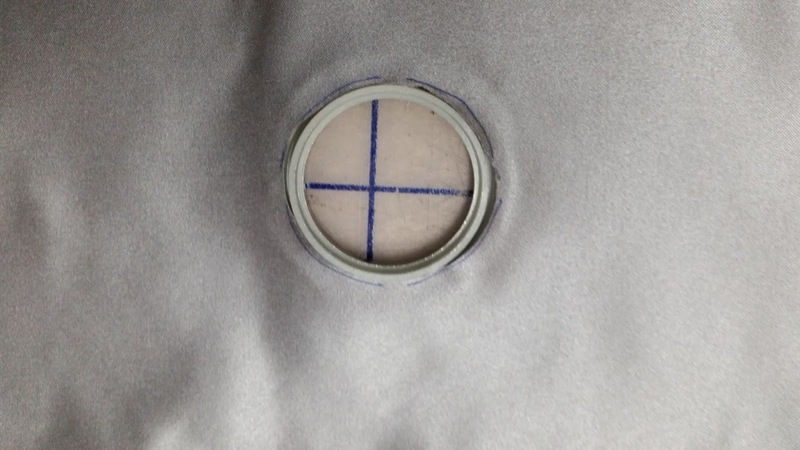 Sometimes ponte fabric can pill, usually when it has poly in it. Not that the ponte with poly is bad, it just requires the use of a pill-buster here and there. I am excited I don't have to use one on these pants (or the portion of the jacket that has the ponte on it). You can find it in white here at the Fabric Mart shop. Anyhow, after all the pattern fitting/muslins/alterations, I have to say, I like these pants even more than my beloved pair from JCP. I wore this outfit as is to travel to Louisiana from Virginia with three kids in tow. We also ran around New Orleans shopping and eating and walking around, and the outfit held up to the day and still looked fresh after the whole day was done. I wore the jacket again today, too. It looks pretty cute with the fair isle sweater I wore underneath it! Okay, that's it for now! Have any of you delved into the athleisure trend? Have any of you tried demystifying your own particular fit needs through tissue/muslin fitting? Happy Sewing! And Happy Thanksgiving! For this project, I used a pattern that I had previously made and loved--HotPatterns Classix Nouveau Refined Peasant Blouse. For my previous version of this top, I used a cotton double gauze. 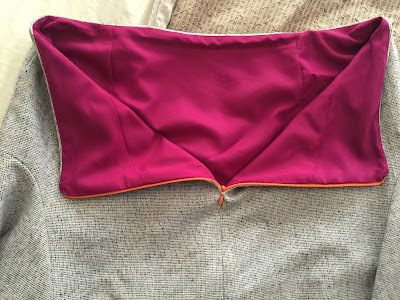 I've been wearing that version nearly non-stop, so for my second version, I decided to up the ante and use a silk double georgette from Fabric Mart. 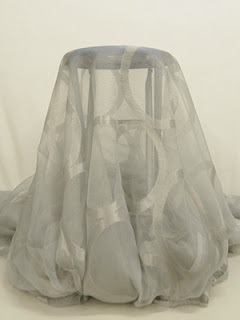 Fabric Mart is sold out of this particular fabric but does have other colors available: Silk Double Georgette Fabrics. Outside of being a bit slippery and wiggly, as silks generally are, this fabric was lovely to work with. That's a LOT of gathering in that neckline, and the silk handled it like a pro. 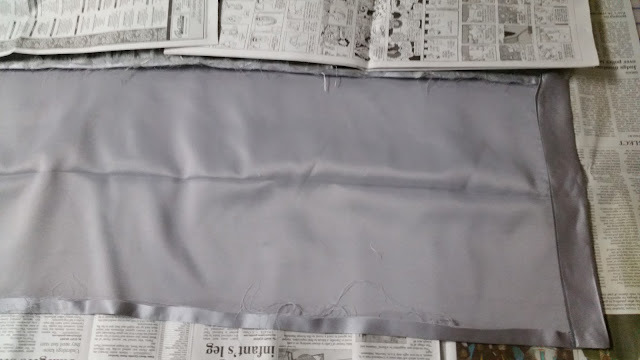 Additionally, it pressed very nicely (I used my steam iron on a medium-high heat setting) and didn't ravel nearly as much as some silks that I've worked with. 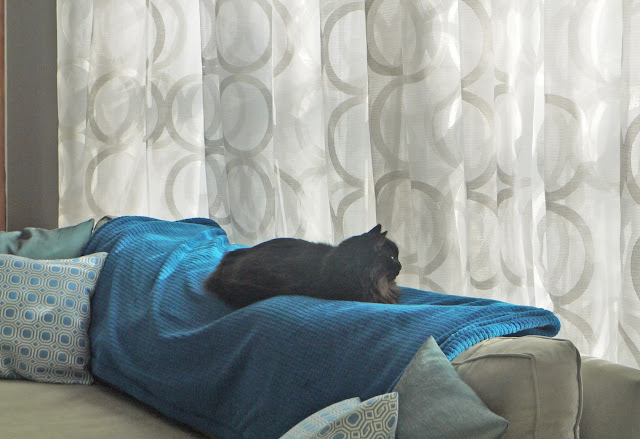 Amazingly, even though my cat kept insisting on sitting on and kneading the in-process blouse, it didn't even pick up any cat-claw-related runs. For fitting alterations, I only did a small FBA (rotated to the neck gathers) and widened the wrist cuff a bit. (The cuff was a bit snug on my original version.) I'm not even sure that I needed the FBA, which I'd made primarily to keep the blouse from riding up in front. However, this silk has such a nice drape that ride-up doesn't seem to be an issue. 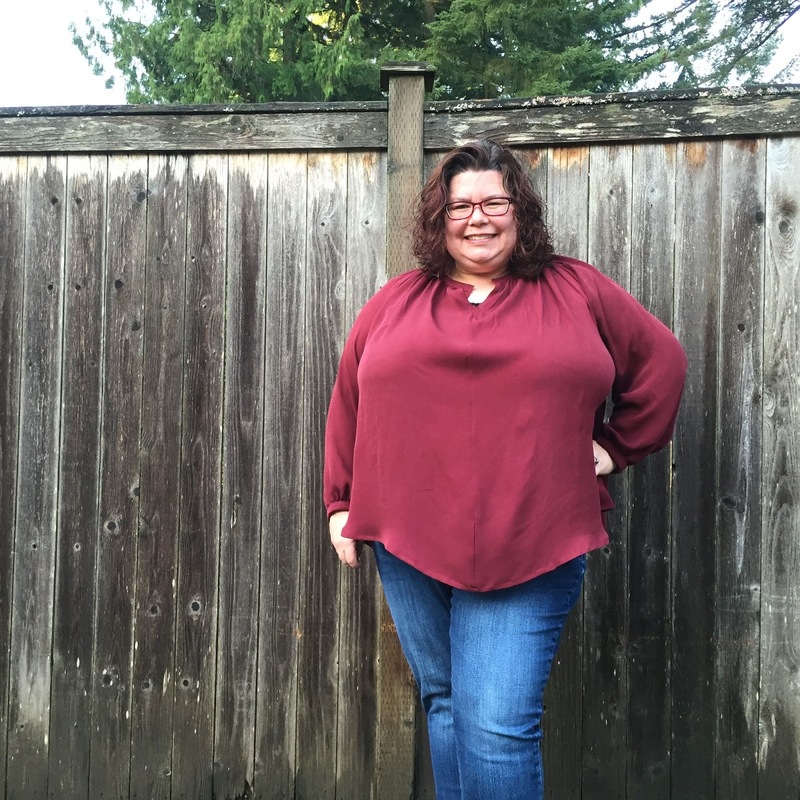 I'm happy to be able to add this blouse to my closet. It's nice without being too fancy and wasn't terribly difficult to sew (silk slipperiness aside). 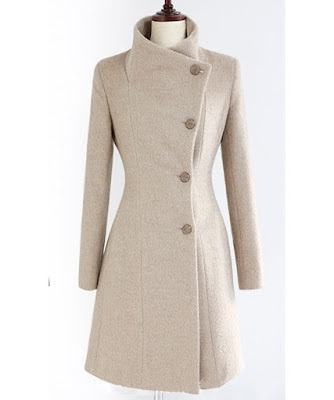 When I started thinking about coat making, I had a structured coat in mind. 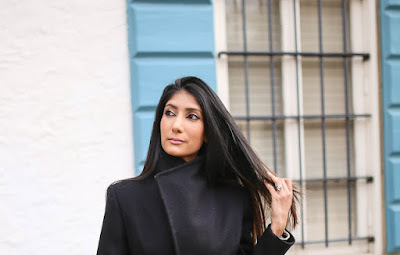 I have always been fascinated with the structure that goes inside a tailored jacket or coat, so I decided I wanted shoulder pads, I wanted hair canvas and pad stitching, I wanted sleeve headings, I wanted it all!!! I chose to go with a design that was a bit millitary-esque. I exaggerated the neckline for a more dramatic look and used custom-made shoulder pads to add structure to the garment. I also used hair canvas throughout the neckline to make sure it would stand up. 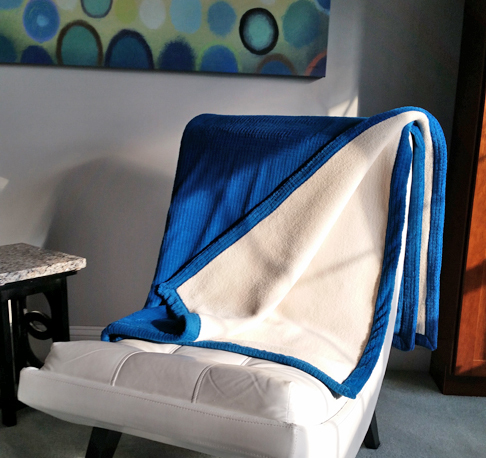 The fabric is a yummy 100% wool melton coating fabric from Fabric Mart. You can check out their gorgeous selection of wool fabric HERE. I really am in love with this neckline...It's oh-so-majestic! 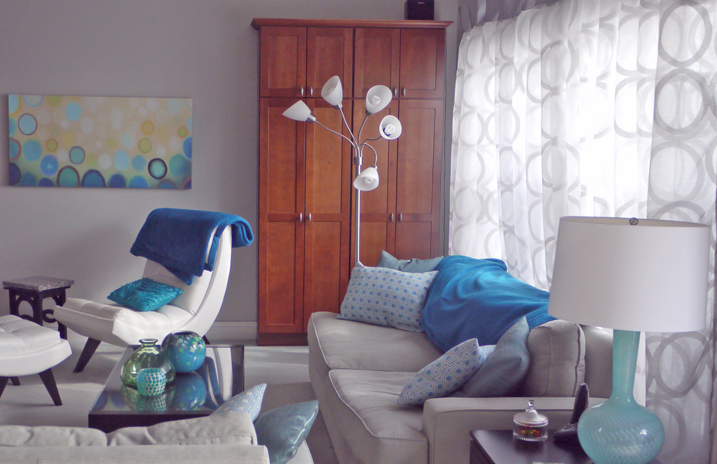 If you look at my inspiration pic, you will see that my version is very similar to it, with minor variations. Since time was of the essence, I decided to take a ready made pattern and modify it instead of making my own pattern from scratch. 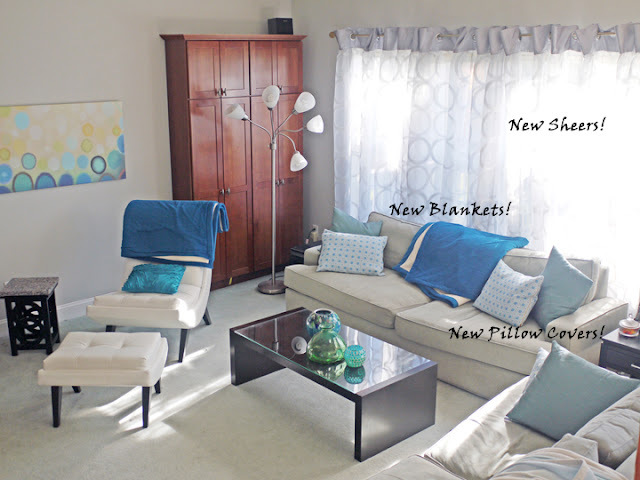 The pattern I used as a base is Vogue 8346 view A, and modified the pattern accordingly to match my inspiration. 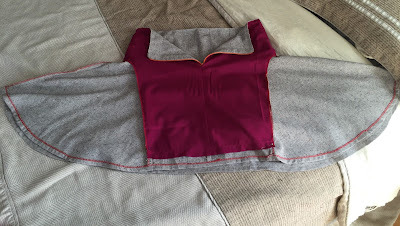 The main pattern alterations I made included changing the front bodice, and the collar. I also lengthened the coat by an inch and a half. 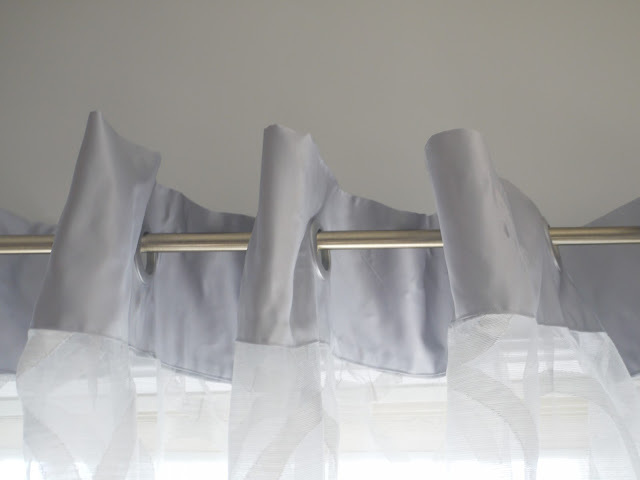 Of course I made a muslin. I actually ended up with three alterations. 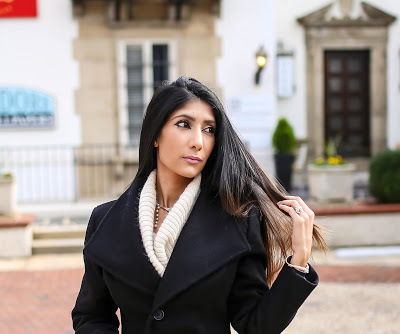 Moving on to one of my favorite things about this coat... Not only does it have the gorgeous stand up collar that I wanted, it also converts into a gorgeous shawl collar. I mean... two looks in one?! That's what I'm talking about! 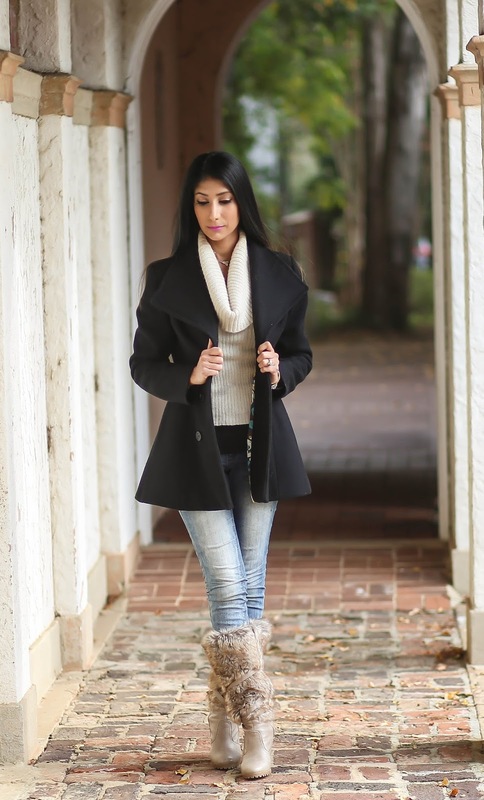 I styled this coat with one of my favorite cowl neck chunky sweaters, a classic double stand of vintage pearls, My favorite skinny jeans and the boots with the furrrrr!!!!! And the coat looks just as nice with the buttons undone. It's such a classic pointy shawl collar. 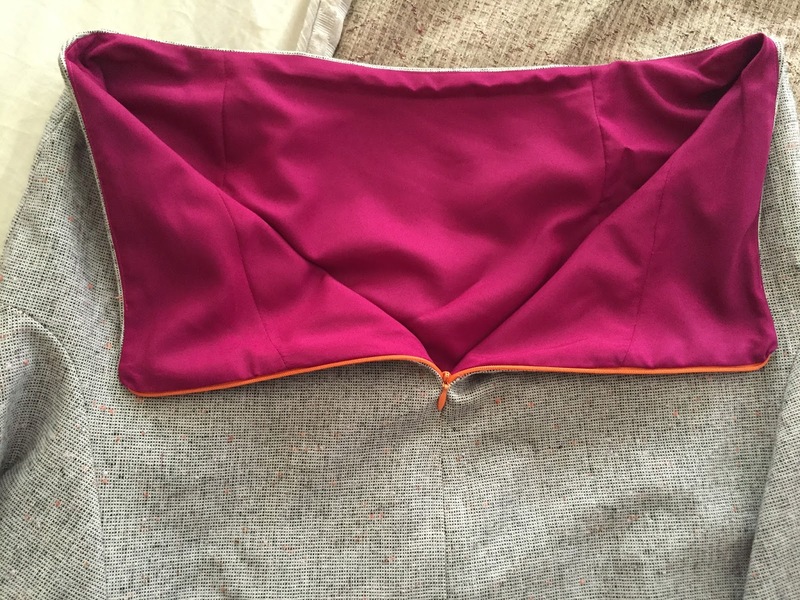 It's not a true shawl collar because I did preserve the original collar from the center back seam to the shoulder seam. But no coat is complete with a fabulous lining..... so I lined this coat with a pretty silky fabric just like I did on my wool cape last month! 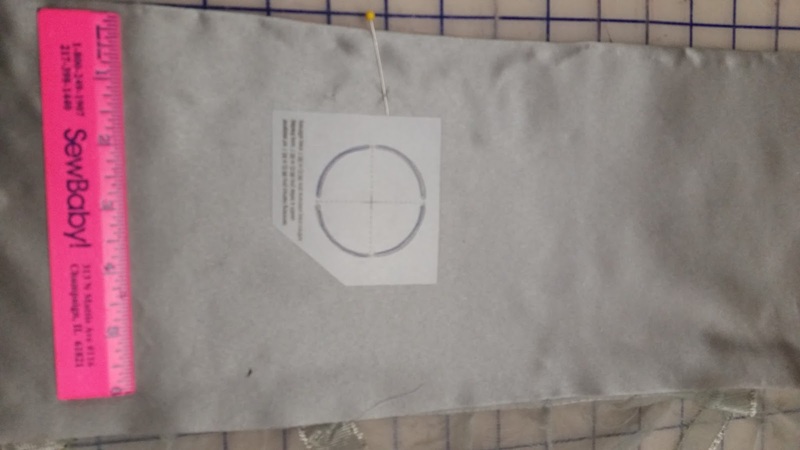 This was my first time making in-seam pockets. 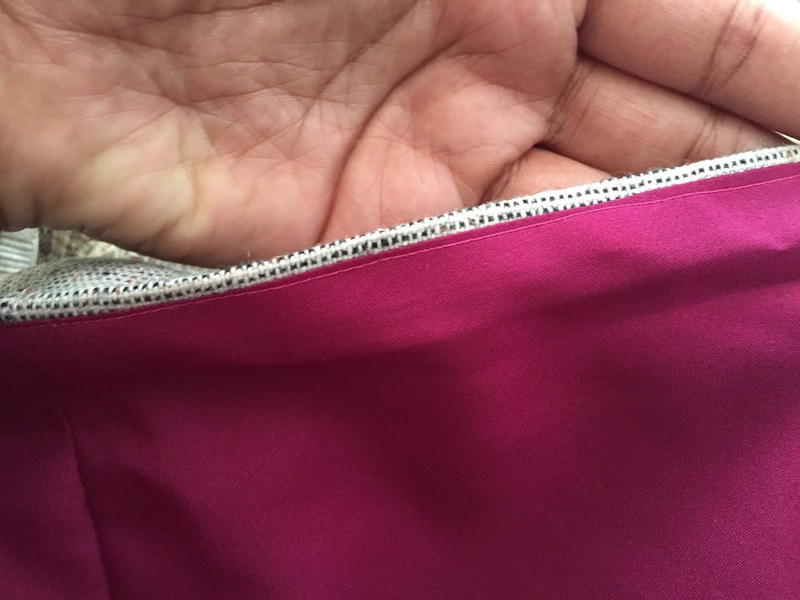 In-seam pockets are actually really easy to sew! I am not sure why I was shying away from them! 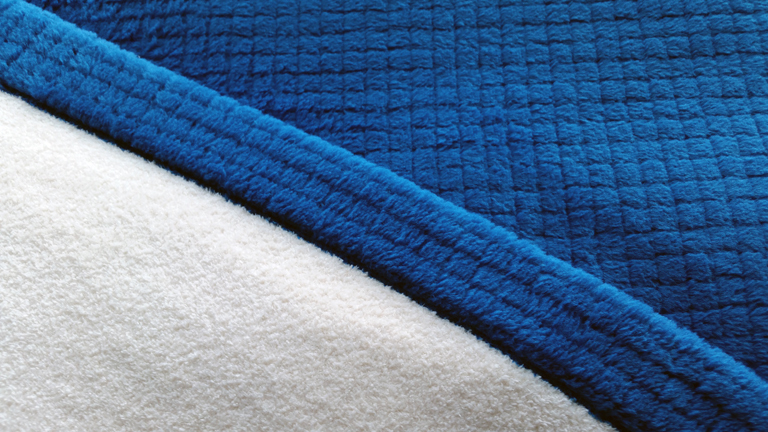 The hybrid method of tailoring that combined fusibles and padstitching. Overall, this was a really amazing project. I hope that you enjoyed reading this. Leave me a comment and let me know what you think about it! 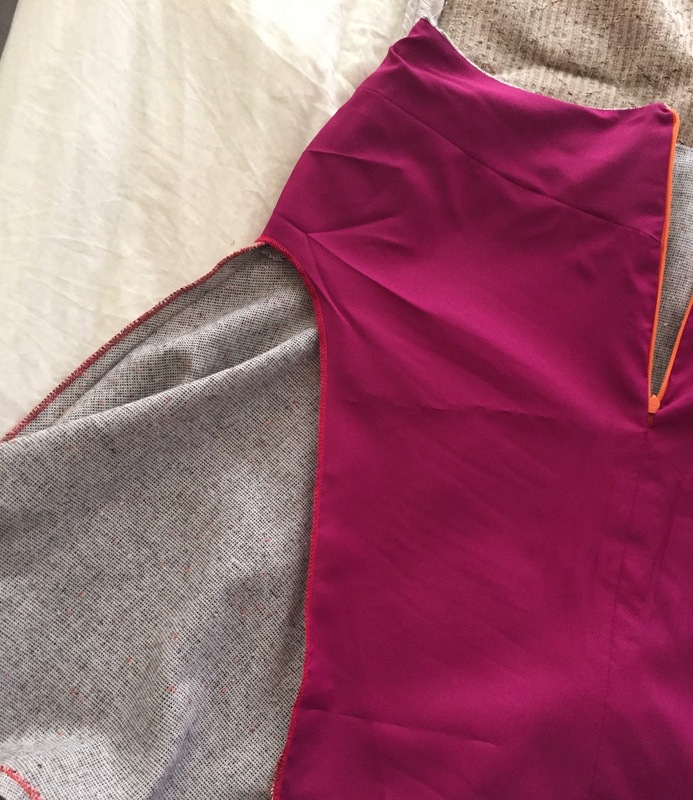 I will be doing a "Behind The Seams" blog post on the making of this garment, so you can come into my workshop and take a virtual tour of all that went into making this coat! And until next time, happy sewing!